Finalist in the 2012 Portia Geach Memorial Award. 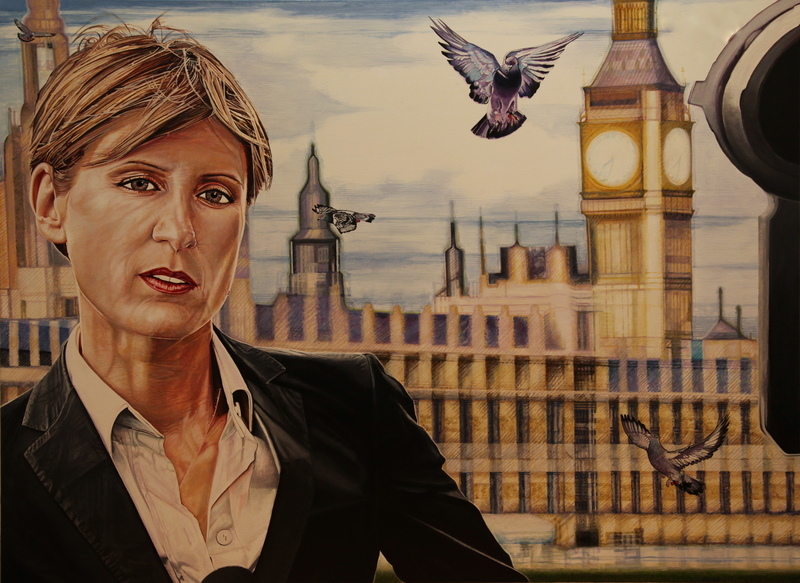 Portrait of the ABC’s ‘Lateline’ presenter Emma Alberici entitled’ ‘Emma Alberici Corresponding from London with Circling Homing Pigeons’ is chosen as a Finalist in the 2012 Portia Geach Memorial Award. Filippa Buttitta was walking down a London street when she recognised a familiar Australian face – that of The ABC’s former Foreign Correspondent and now ‘Lateline’ presenter Emma Alberici. Impulsively she called out to Emma and from that moment exchanges of Australian familiarity, interests in things foreign (including their Italian background) and discussions about their experiences of growing up in Australia prevailed. For years Filippa had watched Emma on Foreign Correspondent and thought that she would be an ideal subject to paint. They both share the same age, experiences of growing up with Italian immigrant parents and an interest in cultural and foreign political matters. What followed out of a spontaneous meeting was a series of email exchanges across the world, international phone calls and finally a sitting in Filippa’s studio once Emma moved from London to Sydney to take on the role of Lateline presenter. The painting ‘Emma Alberici Corresponding from London with Circling Homing Pigeons‘ portrays Emma in a moment of contemplation prior to giving commentary in front of an ABC camera as a foreign correspondent in London. Filippa’s incorporation of homing pigeons are metaphorical symbols of flight, communicating from distances, the imparting of knowledge from one place to another as well as encountering the familiar, foreign and spontaneous and the relationships between these in time and space.